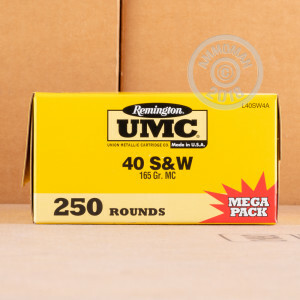 This 1,000 round case of .40 S&W cartridges from Remington UMC, packaged in 20 boxes of 50 rounds each, is a great deal for serious practice with your self-defense weapon. The 165 grain full metal jacket simulates the performance and recoil of lighter hollow points rounds. 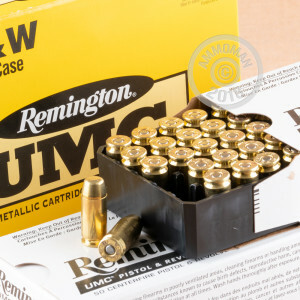 Each cartridge uses non-corrosive Boxer primers and reloadable brass cases. Manufacturers of 9mm pistols frequently offer .40 S&W chamberings of their designs due to the growing popularity of .40 S&W for self-defense and police use. These include the Glock 23, Browning Hi Power, Sig P226, and even 1911-pattern guns. 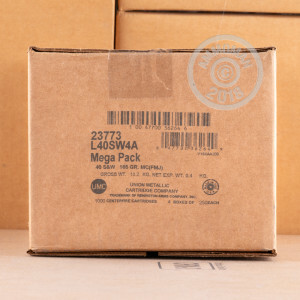 Pick up $99 or more from AmmoMan.com and get free shipping direct to your door!